Did you know that an estimated 95% of our population is deficient in Iodine? Do you suffer from lack of energy, headaches, irritability, muscle cramps, hair loss, brittle nails, cold hands and feet or muscle weakness? These are all symptoms of Hypothyroidism associated with low levels of Iodine. Unfortunately, one bad study in the late 1940′s denounced Iodine and the entire medical community switched to anti-biotics (and we know how well that has turned out). Dr. David Brownstein MD, author of Iodine: Why You Need It, Why You Can’t Live Without It, states in his book that Iodine is one of the most misunderstood nutrient and suggests through his extensive research that most of the population is grossly deficient in this valuable mineral. He further stated that it is impossible to achieve your optimal health when there is iodine deficiency present.Dr. Brownstein recommends a supplement of 25-50 mg daily. Add an additional 400 mg of L-Tyrosine, which is a building block for the thyroid hormone controlling our metabolic rate and energy level.Some of you may also be wondering about the long-term effects of the Fukushima nuclear plant explosion. A recent study by the University of South Wales indicates that the radiation from that explosion will begin flowing into our U.S. coastal waters in early 2014 and peak in 2016. 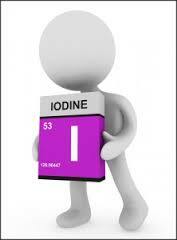 Iodine protects your thyroid gland from being harmed and prevents it from absorbing the radioiodine. If you are noticing fatigue and weight gain, Dr. Brownstein’s research supports the necessity for an effective iodine supplement. Maybe it’s time to rejuvenate your thyroid  that master of metabolism. When your thyroid is functioning at less that optimum, you can bet that you will feel sluggish, tired and foggy. It is estimated that as high as twenty percent of all adults have hypothyroidism that has not been clinically diagnosed.Sluggish? Tired? Foggy? Iodine May Hold The KeyUnfortunately, due to today’s environmental pollutants, iodine deficiency has become a worldwide epidemic. It’s common knowledge that pollutants cause cancer, but what many don’t know is that these pollutants cause a deficiency that can make us sick. This entry was posted in Just Good Stuff and tagged Iodine, L-Tyrosine, Thyroid. Bookmark the permalink.